Living LIGO: Q: What Do Gravitational Waves "Sound" Like? Q: What Do Gravitational Waves "Sound" Like? Okay, this isn't a question that I usually get asked but the answer to this question is the basis of my answer to questions about how we can determine information about what produced a gravitational wave from the signals we detect. So, how do we do that? Radio stations broadcast radio waves at a specific frequency (this is the number that you tune your radio to) and music is encoded onto this wave. Whereever you are right now, you are most likely surrounded by radio waves from numerous stations but you can't hear radio waves or the music that is encoded onto them. To hear this music, you need to have an instrument that can detect the radio waves, decode the music from them, and turn this signal into sound using a speaker. Now, you can hear the music. LIGO is a completely passive detector (meaning we just wait for something to happen, we cause nothing that we can detect other than noise) just like your radio is passive (it can't create music). We wait for a gravitational wave to pass by Earth, and if it is strong enough and in the frequency range that we are sensitive to, then LIGO will detect a signal. From that signal, we can extract information about what made the gravitational wave, like a radio decodes the music from the broadcast radio waves. Once we have detected the signal, we can put that signal through speakers to convert it into sound. Just like a radio, it is the speakers that make the sound and not the detector. Since LIGO is sensitive to frequencies that are in the same ranges of sounds we can hear, we can hear the gravitational-wave signals when put through a speaker. Now we can extract information about what made the gravitational wave just like we can hear the different instruments and voices in music. LIGO sensitivity vs. frequency (see this post for a description of how to interpret this plot). Click on the graph to see a larger image. Recall from a previous post that it is because LIGO is most sensitive to the audible frequency range that we cannot detect gravitational waves from the Moon, Sun, and planets; they produce gravitational waves at much lower frequencies. Inspiral gravitational waves: two massive objects orbiting each other faster and faster as they get closer together and eventually merge into one. Pairs of neutron stars, black holes, or the combination of the two are prime candidates for detection. 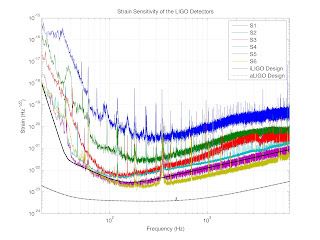 Stochastic gravitational waves: many weak signals from different sources combining into one "jumble" of a signal. Relic gravitational waves from the Big Bang are expected to be candidates for detection. Burst gravitational waves: these waves are short duration and from unanticipated sources or from known sources where we can't be sure what the gravitational waves will "sound" like. I like to call these the gravitational waves that go 'bump' in the night. By studying the predictions of what different gravitational waves will "sound" like, we can translate a detected gravitational wave into information on the system that made it. DO WE ACTUALLY LISTEN FOR GRAVITATIONAL WAVES? I also wrote in March 2011 about a fake signal that was placed (injected) into the LIGO data to test if our data analysis techniques could really detect a gravitational wave if there was one. This was a blind test (called the "Big Dog" due to its apparent location in the constellation Canis Major) meaning that only a few individuals knew about this fake signal and the rest of us were left to find it and interpret its results. While we did not detect this signal by listening to it, it can be heard in both the LIGO detectors (about 17 seconds into the recording linked below). This is real LIGO data and the sound may be VERY LOUD - so turn your volume down before you play it and then adjust it! ⇒Click here to hear the data around the blind injection for LIGO Hanford, WA. *Note that there is a audible instrumental "glitch" in the Livingston data about 8 seconds into the recording; this is unrelated to the injection. While it is difficult to hear gravitational waves that will be buried in detector noise, there is no denying that the human brain is very effective at breaking sounds down into their individual components. A recent Physics Today article titled "Shhhh. Listen to the Data" discusses the advantages of humans listening to data and features a discussion of this application to LIGO. Also, if you want to test your ear's talent at "hearing" gravitational waves, there is a fantastic website called Black Hole Hunter which places black hole gravitational wave "sounds" (like the system in the movie above) into simulated data and tests if you can discern the signal. I've spent many an hour playing with this and even use some of the cell phone ringtones they've made (also available on the Black Hole Hunter site). Truth is, I haven't updated this in a long time either (having a baby does have a way of forcing one to prioritize one's time...), but if I ever do, the update will appear at the gmunu site. Thanks for the updated link! I've always loved your page since even if it is a little dated, it does a great job explaining the sounds. I will make sure to put the updated link in the blog post so that everyone can see it (not just those who read the comments). I bet if a very strong gravitational wave went through an object you'd be able to hear vibrations (though that really would be a worryingly strong wave). You are right about a *worryingly* strong wave making a sound. The first method of looking for a gravitational wave was a bar of metal that will ring like a bell when a gravitational wave at the right frequency passed by. It would never make a "sound" but sensitive accelerometers would be able to detect the vibration. I plan a post on this, but until then you can look up "Weber Bar". By the way, I came on one of your LIGO tours in late May in a group of particle accelerator physicists. I just got around to organising my photos and found your blog! I really enjoyed the tour, though I probably asked too many questions (I always do that). True, the bar detectors were only sensitive to one frequency, but when you have an inspiral source it creates a chirp (which you can hear above) and signal goes through a range of frequencies. If the chirp passes over the resonant frequency of the mass, it will set it ringing like a bell. Q: What Would a Gravitational Wave Feel Like?